More and more folks I know are cutting sugar out of their diet, whether it be going on the Keot diet or just being a more conscious consumer. While I admire their willpower to do this, I know that I will never be able to cut out sugar. My sweet tooth cannot be ignored (not to mention I am usually surrounded by all things sweet daily), so, lately I have been trying to find healthier sugar substitutes and make baked goods that are less of a guilty pleasure. Ok, I know that this is another pumpkin flavored something and that a lot of us are sick of that by now, but there is a method to the pumpkin madness. 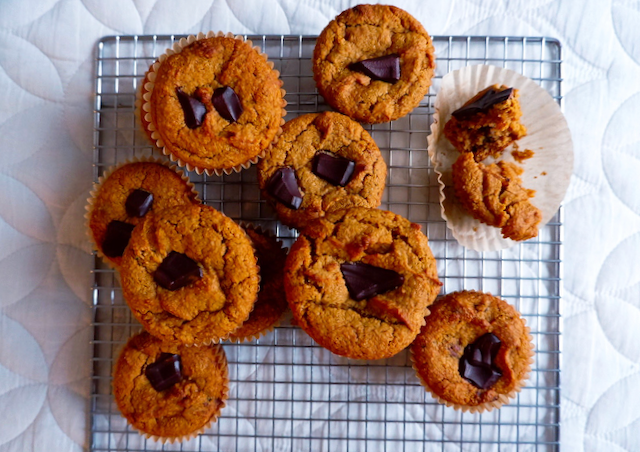 Pumpkin is a great substitute for fat because it adds moisture to the muffins. Now, we still need fat (fat is our friend), but using almond butter means we get the fat and some added protein too. While you can certainly use regular light brown cane sugar for this recipe, I wanted to use a low glycemic sweetener. I have been swapping coconut sugar for light brown sugar or granulated in almost everything I bake lately. It is a great alternative to cane sugar. While it does not contain any less calories, it is a low glycemic sweetener, which means your body can digest it slowly and needs less blood glucose to process. That means so post-sugar crash. Some great healthier sugars are maple sugar, coconut sugar, or date sugar. You can certainly use maple syrup or date syrup (both delicious), but be careful of the added moisture they add to your mix. And what if you want to nix the sugar all together? I made these muffins using a sugar substitute called Swerve. It is made rom Erythritol, which is a no calorie sweetener that bakes and measures just like sugar. Out of all the sugar substitutes this is my favorite, but one draw back. I don’t know why, but this sweetener leaves a slightly floral flavor behind. It does not taste bad at all; it’s just unexpected and something you wouldn’t get if you used coconut sugar or cane sugar. Line a muffin pan with paper muffin cups; this recipe makes 12 standard size muffins. In a large bowl, combine the pumpkin, almond butter and coconut sugar (or sugar substitute). Mix to combine; add the egg and vanilla extract and mix again until smooth. Add the flour, baking soda, salt, spices and potato starch to the pumpkin mixture and fold to combine. When the almond flour is mostly incorporated, add the chocolate chunks, saving some to top the muffins with. Continue folding until all the flour is incorporated. Scoop the batter into the muffin cups (I use a 2 tbsp cookie scoop) and top with remaining chocolate chunks. Bake for 25 to 28 minutes. Let cool for 30 minutes before digging in! These babies are great for breakfast, topped with more almond butter and apple or for dessert, warmed up with ice cream.